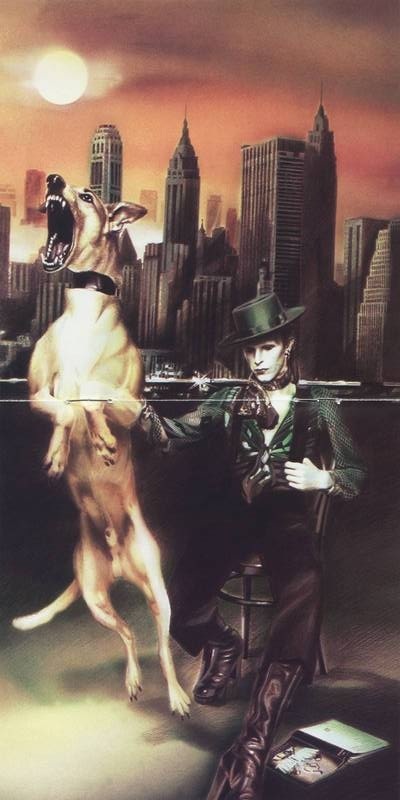 This entry was posted on Tuesday, September 14th, 2010 at 9:51 am and is filed under Diamond Dogs: 1974. You can follow any responses to this entry through the RSS 2.0 feed. Both comments and pings are currently closed. I’m sure I read somewhere (maybe the letters page of the NME at the time) that the audience applause was nicked from the live Faces LP Coast to Coast, and that you can hear Rod Stewart shouting towards the fade. that’s true–am going to ref. that in the “diamond dogs” entry. The opening Future Legend fired up my imagination as a an 8 year old lad sat at my cousins house playing his new l.p’s and so began a life long love of Bowie. I must commend you on this staggering piece of work your doing collecting all the references and a real sense of place for Bowie’s music, you not shy of repremanding him of some of his pretensions and musical theft. Great read !!! ‘Ulmers? Goffs?’ Jim gazed upon him thoughtfully, for that was how the boys talked of the creatures who dragged and swayed and slumped through their dreams. In the bad dreams of William, the ‘ulmers’ moaned and gibbered and had no faces. In the equally bad dreams of Jim, the ‘goffs’, his peculiar name for them, grew like monster meringue-paste mushrooms, which fed on rats which fed on spiders which fed, in turn, because they were large enough, on cats. In a lakeside house in Montreal in 1974, the feral, haunting howl with which this tone-poem begins made my father howl in protest (“That’s awful, Nicholas!”), which only made the 14 year-old me like it even more. It didn’t take much to convince Dad, though, that the scenario that followed owed a lot to a poem he held in high regard, TS Eliot’s The Wasteland. Regarding the album’s “laziness”, while I do agree that Bowie puts in a lot less plot — and graft — than, say, Rice and Webber, I’d have to say he achieves vastly more in terms of texture, atmosphere and character. Sweet Thing, for me, is the best thing he ever did. For Bowie — an artist who used his body more, and better, than most — characters were concepts to be worn, rather than written. Make-up counted for more than continuity. Narrative was an excuse for a certain kind of histrionic delivery, a string for fragmented fantasies. Films, theatre and musicals based on Ziggy, Diamond Dogs etc are conspicuously thin on the ground. I mean, how would you even go about scripting one? You’d have to start from scratch. And your plot would be pretty spurious, and would finally detract from the whole thing. What did Halloween Jack do when he met the 15 Financiers? Do the Diamond Dogs end up chewing the bones of the Circling Skeletons? Do we really have to go there? What matters is the immediate drama, pretext for the flickering emotions, the tone of voice, the timbre of the instruments, the churn of chords, the poise, the flange, the glamour, the despair. And this is still a brilliant, brilliant album. It says a lot more about how life felt in the 1970s — chaotic, decadent, exciting — than any well-made plot could’ve done. I’m wild again…beguilded again…a simpering, whimpering child again…. However it sounds now, I thought it was the coolest thing ever when I was twelve.